BRIEF CAMP DESCRIPTION: Summer camp is a great time for new students to jump in to circus and experienced students to hone their skills! Students will learn: Aerial Silks, Stilt Walking, Juggling, Poi, Diabolo, Tightwire, Globe Walking, Rola Bola, Trapeze and Sling in addition to clowning, theatrical and creative activities! CAMP LOCATION: We are conveniently located just off I-10 on Speedway, just north of downtown Tucson. 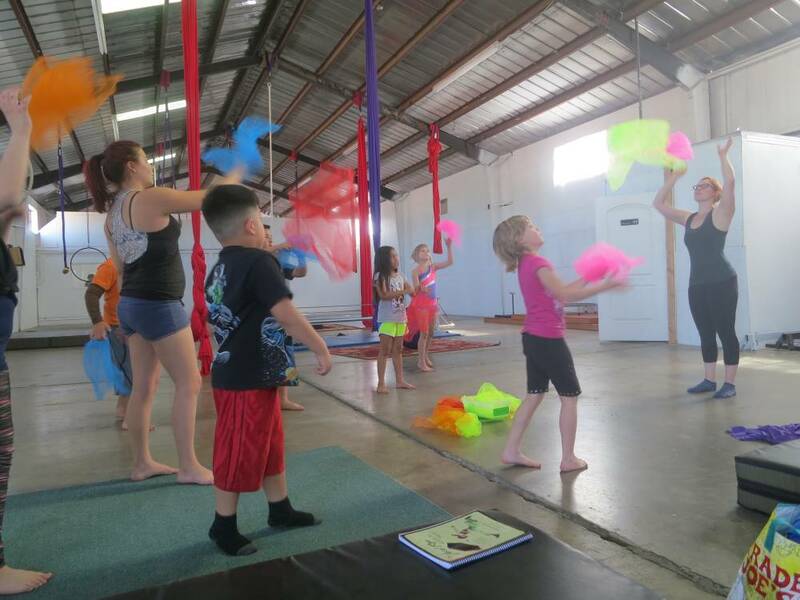 CAMP FACILITIES: Our beautiful 5000 sf warehouse with 20 ft. ceilings is the perfect place to train in circus arts. YEAR-ROUND PROGRAMS: We also offer year round circus training programs for children and adults. Camp weeks begin on June 3rd, 10th, 17th, 24th and July 1st and 8th. Advanced camp weeks are July 15th and 22nd. It runs from 9:00-4:00 each day. Summer Camp is geared toward ages 7 to 18. $230.00 per week.